Motif Publisher Mike Ryan and former US presidential press secretary Sean Spicer (L-R:) at book signing for The Briefing, Barrington Books, Cranston, RI, on July 28, 2018. 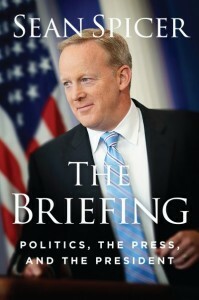 RI native and former Trump press secretary Sean Spicer was in town in July representing and signing his new memoir, The Briefing: Politics, the Press, and the President. Spicer grew up in Barrington and attended Portsmouth Abbey School. He lasted six months as President Trump’s first press secretary (not a short tenure in the Trump administration). 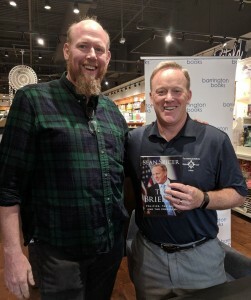 Other recent book tour appearances have produced controversy (a signing in Middletown prompted a former high school classmate of Spicer’s to level accusations of bullying and using the N-word, a signing in Cambridge was canceled “due to the political climate,” and a signing in Barrington attracted protesters). There was a noticeable police presence, but no incidents at the signing Motif attended at Barrington Books in Cranston on July 28. Spicer was interviewed in front of a small crowd by former US Ambassador to Malta and former Providence Mayor Joseph Paolino, and took questions from the crowd afterward. “You were including the internet?” the audience member followed up. “Apparently not very well,” Spicer retorted, pausing for laughter from the crowd. “For the rest of my life that’s going to follow me, and if I could do it again, of course I’d do it differently. All I could think about was all the people who’d supported me and had confidence in me, and I’ve let them down. I didn’t go out there and intentionally say something that was wrong – I screwed up.